I don’t even know where to begin with the perfection that was Harry Potter and the Cursed Child. I grew up reading the Harry Potter series. I was a young teenager when I read the first book and I’ll be honest: I wasn’t thrilled about Cursed Child when I heard about it. I thought Harry Potter ended perfectly and nothing needed to be added to it. I swore I wasn’t even going to buy Cursed Child, but faced with the actual release – I crumbled. I wanted so badly to go to the midnight release nearest me that my husband got the hint and surprised me with a copy in the morning! 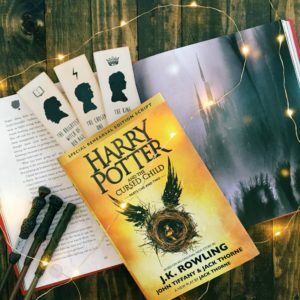 It took me less than 24 hours to read Cursed Child and it was pure perfection beginning to end. I thought my favorite characters were going to be ruined, but instead I was met with grown up Harry, Ron, and Hermione and they couldn’t have been more realistic. It felt like they grew up with me. I read the series as a teenager, when they were teenagers, and now I’m 31, with children, just like them. I was easily able to relate to the hardships Harry faced with his son, Albus. Sometimes I was angry at Harry and sometimes I was angry at Albus – it felt all too real. It’s also not easy being a teenager to one of the most famous wizards. Everyone knows Harry Potter and I can’t imagine the pressure Albus felt being his son. I felt for Albus as much as I did for Harry. I have a long list of favorite characters from the Harry Potter series and Scorpius Malfoy has been added to it. He was such a fun and loving character! He made me laugh, feel sorrow, and had me rooting for him the whole time. He was such an endearing character. And the relationship he had with Albus was golden. I admired their friendship and how Albus befriended him despite his parentage. I also loved how honest Scorpius was with Albus when Albus was being difficult and a crappy friend. Their friendship is goals! I truly enjoyed Harry Potter and the Cursed Child. I’m so thankful for the nostalgia it brought. Just reading about Harry, Ron, and Hermione, and, once again, more wizarding adventures made me the happiest person. I know Cursed Child was written as a play, but I can easily see it as an actual novel, and definitely as a movie. Thank you !it was awsome.I can’t buy this book but with your describing ,I’m so eager to read it..
Well summed up, Sam! I’m also posting a Cursed Child review later! Thanks Ali! I can’t wait to read yours. I’m glad you enjoyed the book despite the mixed reviews love! I won’t be able to read it so soon as I’ll have to reread Harry Potter series first. Haha. I read it without reading other people’s reviews. There’s too much negativity out there about it.